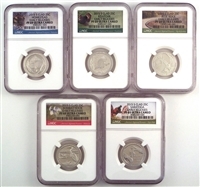 In 2010, the United States Mint began issuing 56 quarter-dollar coins featuring designs depicting national parks and other national sites as part of the United States Mint America the Beautiful Quarters® Program. The program was a reaction to the massive popularity of the State Quarter program and will continue until 2021. Here you will find an assortment of Silver and Clad Proof Quarter sets from 2010 to the current year.